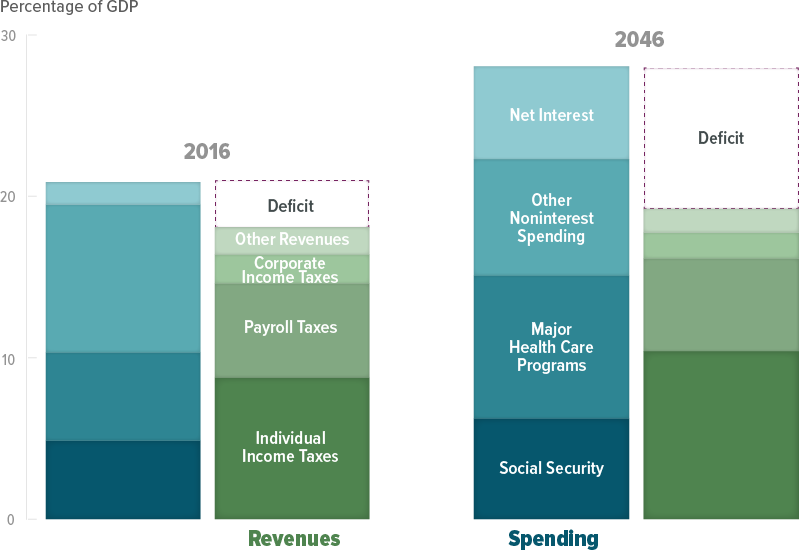 CBO’s long-run budget projections show a substantial imbalance in the federal budget beyond the next 10 years, with revenues falling short of spending by steadily increasing amounts. As a result, federal debt as a share of GDP would reach unprecedented levels if current laws generally remain unchanged. Such high and rising debt would have serious consequences for the nation’s budget and economy. To deal with this growing debt we must increase revenue for the government or decrease spending. That increasing revenue can come from an amazing robust economy or higher taxes. To even mention decreased spending is ludicrous. 🤑 Look where the bulk of the money goes. Keep all this in mind because the above is the current state of affairs. Ask yourself, if we need so much more revenue to deal with the status quo, where will additional money come from to fix Social Security, expand Social Security, provide free college, expand Medicare and Medicaid, expand Obamacare or provide single-payer health care? Here is a clue, it’s not all coming from the 6% of workers who earn more than $118,000 in a paycheck. Even the millionaires and billionaires don’t have enough cash to handle this tab. Can’t we all just ask the politicians how they will pay for and sustain all their promises?